Fort Magic is an innovative fort building and construction toy that enables children to build 3D, kid-created, "life-size" worlds for inventive play! Imagine the hours of excitement and fun at playtime, play-dates, sleepovers and family-time as children build “forts” shaped like pirate ships, cottages, castles, submarines, airplanes, teepees, tunnels, and so much more…all from ONE Fort Magic kit! Repeated “five star” customer feedback on Amazon shows children and families are playing with and enjoying Fort Magic daily, for months, even for over a year, without getting bored! 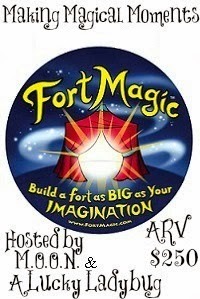 Fort Magic is a fantastic way for parents and children to connect and come together for hours of collaborative play. 142 Straight and Curved Sticks in seven different sizes! 77 Connector pieces in five varieties of shapes and sizes! 130 easy to use fabric and accessory Clips! The fort magic car is cute! I would give this to my nephew, he would love building stuff with it!